Highlighted five examples of partnerships with external organizations served to enhance brand reputation. In recent years, I steadfastly have avoided talking about politics on this blog or any social media platform. However, anyone who bothers to read my bio or resume will see that my first step into health care communications was at Planned Parenthood. It should be pretty obvious how I feel about reproductive rights. Tonight, I am in a random hotel room enjoying The Rachel Maddow Show. Tonight, she had a segment that showed footage from the 1994 clinic shootings in Brookline MA. It honestly had been a long time since I thought about those days of fear and terror. The month before those shootings, I had left my job at Planned Parenthood in Fresno CA to move to the Bay Area. I remember watching the news as it unfolded in MA, being sad, but not surprised. The years leading up to those shooting were tense. Violent rhetoric was the norm. Every person working in reproductive health clinics knew the risks, but showed up each day to ensure women got the care and service they deserve. So, tonight, on this 40th anniversary of Roe v Wade, I send my thanks and gratitude to the women and men who have literally risked their lives to protect the right to choose. The most disturbing part of our time in Morocco has been seeing the proliferation of trash littered everywhere. In city streets, country roads and even in the remotest parts of the Sahara. I keep wondering whether any groups organize “clean up days” the way we do at local beaches and such. If so, they may get added to my favorite charity list. As we sat on the train racing from Marrakech to Casablanca, I pulled open my curtain to look out on open fields. As my eyes adjusted to the sunlight, I was saddened as I realize the landscape is dotted with plastic bags. When we were in the Sahara, we stopped in a small palm grove for a picnic. 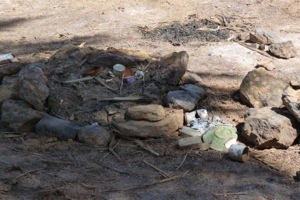 We were disappointed that within a campfire site people had left their trash. Cans, bottles, etc. Even as we visited Erg Chegga, one of the remotest dunes in Morocco, our guide found (and thankfully picked up) a plastic bag. In the states, particularly in California, we teach our kids the “leave no trace” ethic when in the wilderness — what we carry in, we carry out. We’re pretty obsessive about recycling (I have not seen a single recycling bin in Morocco). And more and more, we’ve stopped buying water in plastic bottles — drinking from the tap and even making our own sparkling water. That, of course, has not been possible in Morocco, but even in Europe it was hard to get plain old tap water in a restaurant (only one restaurant in France offered it).